The HPE ProLiant DL120 Gen9, an enterprise class design packed in a dense 1U/1-socket form factor, powered by an Intel® Xeon® E5-2600 v3/v4 series processor. Offering a combination of performance, redundancy, expandability as compared to the traditional 1P servers making the DL120 Gen9 ideal for the growing needs of virtualization and general purpose workloads. Do you need a dense server solution for virtualization, but have difficulty limiting your licensing costs? The HPE ProLiant DL120 Gen9 Server, enterprise class design packed in a dense 1U/1-socket form factor. Offering a combination of performance, redundancy, expandability as compared to the traditional 1P servers, making the DL120 Gen9 Server ideal for small and midsize businesses and Enterprise customers and the growing needs of running virtualization and general purpose workloads. 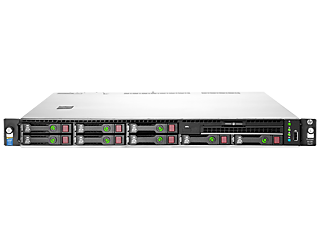 The HPE ProLiant DL120 Gen9 Server supports (1) Intel® Xeon® E5-2600 v3/v4 or E5-1600 v3/v4 processor offering improved performance and efficiency in a dense 1U chassis. HPE DDR4 SmartMemory prevents data loss and downtime with enhanced error handling. Support of up to 256 GB max capacity with speeds up to 2400 MHz. HPE SmartDrives continue to deliver optimal performance, capacity, and reliability to meet various customer segments and workload requirements at the right economics. Supports up to (4) LFF and (8) SFF 12 Gb/s HDD/SSD options with maximum capacity of up to 40 TB. Up to (3) PCIe 3.0 riser slots to support a GPU and networking cards offering increased IO bandwidth and seamless expandability. The HPE ProLiant DL120 Gen9 Server helps reduce virtualization licensing costs with its 1U/1-socket cost optimized design for SMBs and service providers. Embedded with 2x1GbE, up to (3) PCIe slots and choice of HPE FlexibleLOM provide you flexibility of networking bandwidth and fabric so you can adapt and grow to changing business needs. 80 PLUS gold certified entry-level redundant HPE Power Supplies provide up to 92% efficiency which combined with HPE power management features leads to reduction of power consumption and expense. Improved ambient temperature standard with ASHRAE A32 support helps customers reduce cooling expense. With HPE ProLiant DL120 Gen9 Server, HPE OneView provides infrastructure management for automation simplicity across servers, storage and networking. Warranty: Server Warranty includes 3-Year Parts, 1-Year Labor, 1-Year Onsite support with next business day response.